Officially recognised as a UNESCO Global Geopark, the Ciletuh-Palabuhanratu Geopark offers a range of geological wonders, many the result of ongoing subduction in Indonesia. Looking across Ciletuh Bay from the Jampang Plateau towards the ophiolite complex on the opposite headland. Photo credit: Ron Agusta. The mountainous northern Cisolok region, with evidence of the most recent magmatic activity. In the south, the geologically significant Ciletuh area, dominated by a huge natural amphitheatre. Cisolok Geyser. Photo credit: Ron Agusta. The Geopark’s northern area of Cisolok and Palabuhanratu (named after the goddess who, according to local legend, was the Queen of the Indian Ocean) reflects the tectonic evolution of the whole island and demonstrates the progress of a belt of volcanic activity from south to north. The coastal area is dominated by older volcanic rocks, probably Miocene in age, while there is plentiful evidence of present-day volcanic activity in the north, including geothermal systems and active volcanos such as Mt. Salak in the mountainous northernmost region, part of the Gunung Halimun-Salak National Park. Although there are many hot springs along the Indonesian magmatic arc, only one is at sufficient pressure to release water as a geyser, rising up to 5m high. This is situated on the Cisolok River in this northern section of the geopark, and is a popular tourist destination, along with nearby hot springs and fumaroles. The water is close to boiling point and there is plentiful evidence of the alteration of rocks in the vicinity of the hot springs, related to hydrothermal mineralisation, as well as surface deposition of hydrothermal fluids. Because the hot water passes though the limestone of the Citarete Formation, it has a high calcareous content, which is deposited at the surface as sheets and layers of dramatically shaped travertine, formed through rapid precipitation of calcium carbonate. 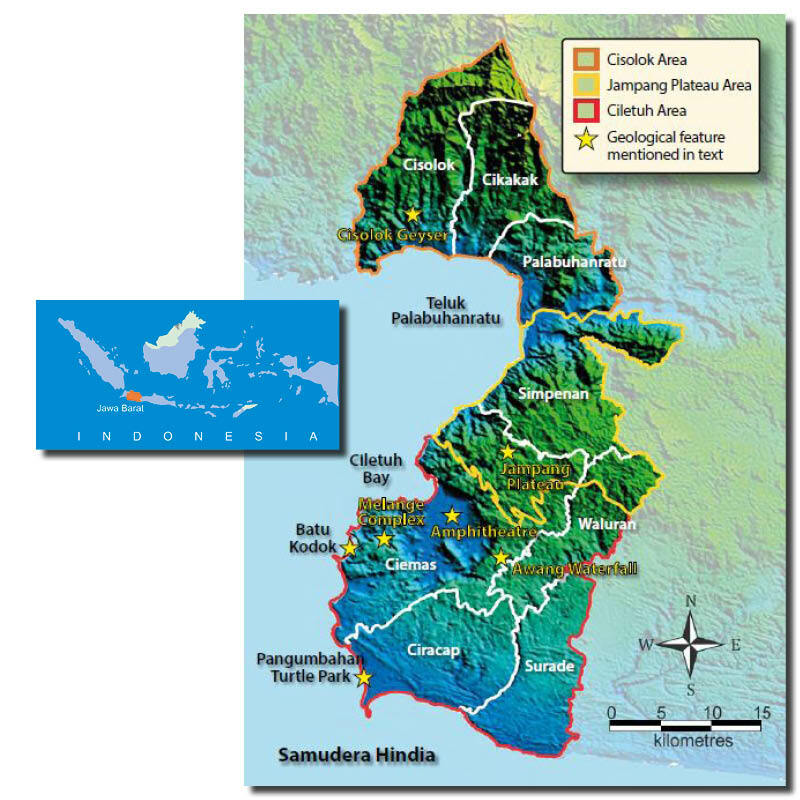 Moving further south, the central area of the Geopark is dominated by the Jampang Plateau, with evidence of slightly older tectonic movements. The rocks here are mostly from the Jampang Formation, with volcanic breccias and lava flows, as well as volcaniclastic sandstones and mudstones and intercalated limestones, all deposited in the Late Oligocene to early Miocene in a marine environment. In the Pliocene to Pleistocene, this area underwent uplift to form the plateau, which has since suffered erosion and peneplenation, leaving the majority of it at about 700m above sea level. Much of the plateau is given over to tea plantations, dating back to the era of Dutch colonisation of Java. Fruit such as durian and dragon fruit are also grown. 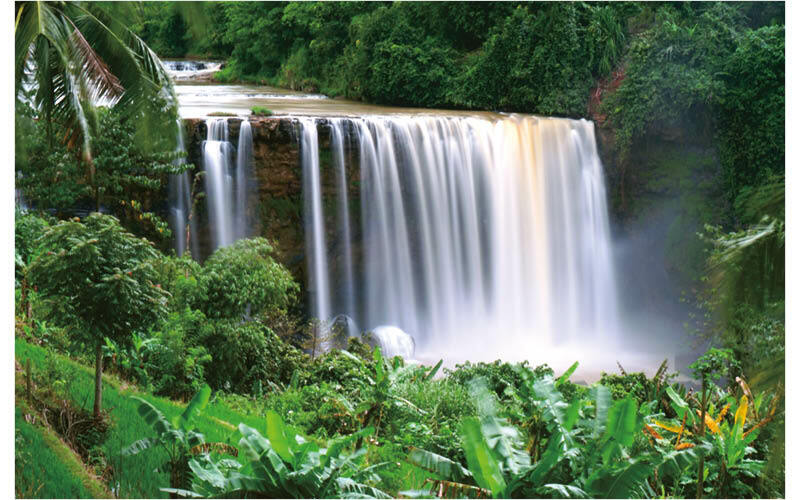 Awang waterfall – Java’s Niagara. Photo credit: Ron Agusta. 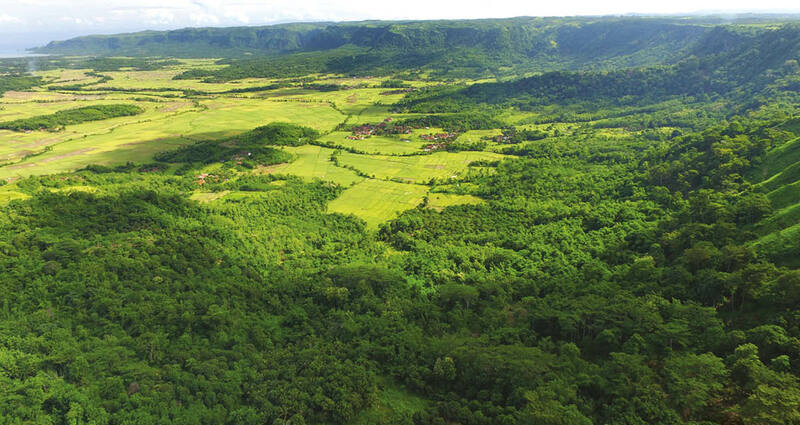 The Ciletuh region, the southern part of the Ciletuh-Palabuhanratu Geopark, is in many ways the most geologically interesting, as it contains remnants of subduction that occurred in the Cretaceous, including rocks that were deposited within a deep trench created during the process. These are the oldest formations found in West Java and include ophiolites, composed of peridotite, gabbro and basalt, as well as metamorphic and sedimentary rocks mixed together to form mélange subduction complexes, both very rare rocks in this region. There is also evidence of pillow lavas. The Oligocene-Early Miocene tectonism uplifted the area, and subsequent erosion in the southern part of West Java exposed the Cretaceous basement. On Dragon Spine Rock from the Eocene Ciletuh Formation. Photo credit: Ron Agusta. These rocks are overlain by Tertiary sediments, the oldest of which are Middle Eocene volcanogenic turbidites and breccias containing basaltic material, deposited in deep water and representing the onset of a renewed phase of subduction. These are the oldest sedimentary deposits in West Java. There are also thick sandstones, possibly deposited in a large prograding delta system in the Late Eocene, while the Oligocene is represented by terrestrial sandstones, reefal and foraminiferal limestones and volcanogenic sediments deposited in fluvial to deeper water marine environments. There was a major phase of subduction-related explosive volcanism in the Early Miocene, possibly associated with the emergence of the island arc. One of the most distinctive features of this area is the horseshoe-shaped Ciletuh amphitheatre, which opens out to the sea at Ciletuh Bay. Encompassing 135 km2, the amphitheatre is the result of the gravity-induced collapse of part of the Jampang Plateau in the Pleistocene, triggered by tectonic movement along faults. This has resulted in steep cliffs up to 500m high around the valley, which feature many spectacular waterfalls. In the dry season the clean surfaces behind these provide excellent exposures of the flat-bedded nature of the sediments of the Jampang Formation in this area – and also offer good practice walls for climbing enthusiasts. A number of geosites of interest have been identified throughout the Ciletuh-Palabuhanratu Geopark, including the Cisolok Geyser and the Ciletuh amphitheatre, already discussed. The steep-sided Ciletuh amphitheatre is a result of gravitational collapse. Photo credit: Ron Agusta. and rocks of geological significance, such as the ophiolites and mélanges found south-west of the Ciletuh amphitheatre. The small peninsula of Sodongparat is an example of a site identified for its geological significance, because of its good outcrops of peridotite, gabbro, amphibolite and plagiogranite, demonstrating that it represents part of the oceanic crust uplifted due to subduction. Batu Kodok, or the Frog Rock, one of many interesting rocks carved by erosional forces found on the south-west coast of the Geopark. Photo credit: Ron Agusta. 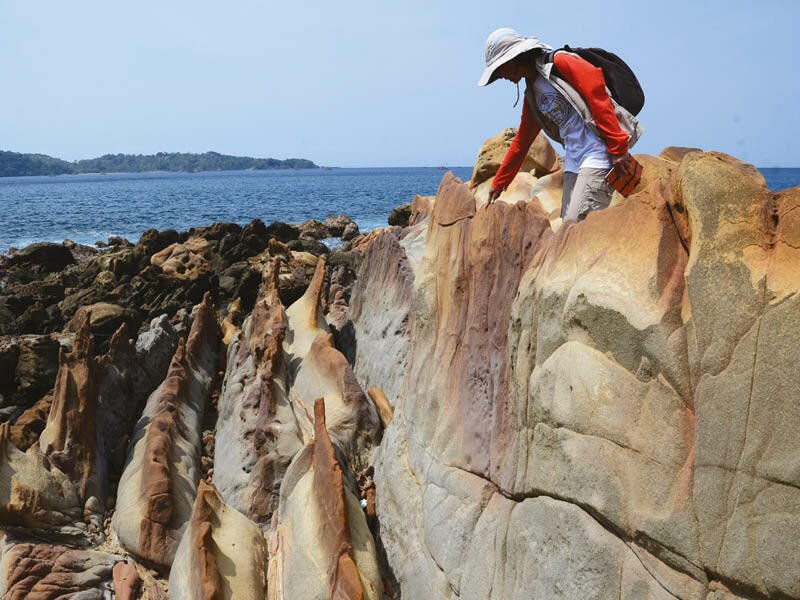 Gunung Badak on the southern side of Ciletuh Bay is another good location for finding evidence of the Cretaceous plate movement, as the rocks are a classic ‘mélange’ complex composed of breccias, sedimentary and metamorphic rock. At this site it is also possible to find peridotite from the upper mantle, along with oceanic crust in the form of gabbro and pillow lava, together with marine fossils. Close by is Pasir Luhur, which is significant in being the only place in West Java where metamorphic rocks can be seen in outcrop. Seren Taun is a traditional harvest festival. Photo credit: Ron Agusta. The Eocene sedimentary rocks which form the west coast of the Ciletuh area have been subjected for many years to the forces of the wind and the sea. As a result, they are carved into spectacular shapes, many of which have been named after the animal or mythological creatures which they are thought to resemble, including a frog, a rabbit and a dragon. 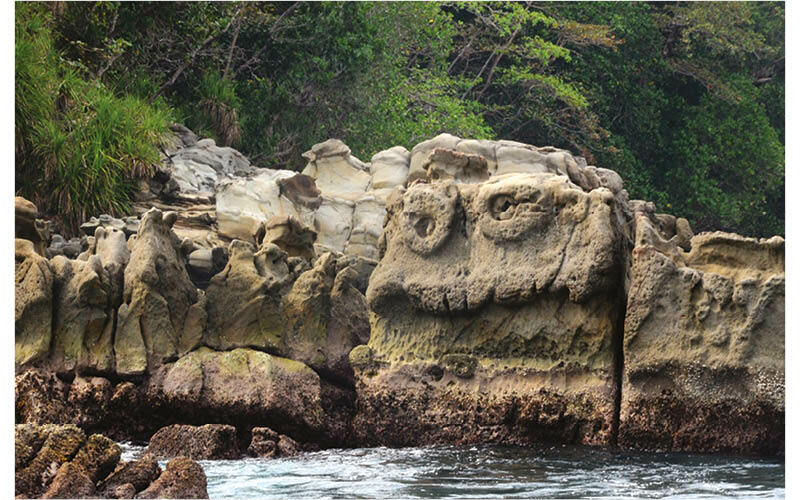 The best way to appreciate these formations is by taking a boat trip along the coast to the south of Ciletuh Bay. Despite Java being the most populated island in the world and home to more than half the population of Indonesia, much of the Ciletuh-Palabuhanratu Geopark is relatively remote and hard to reach, particularly in the south, with very little tourist infrastructure like information boards and signage associated with the geosites. 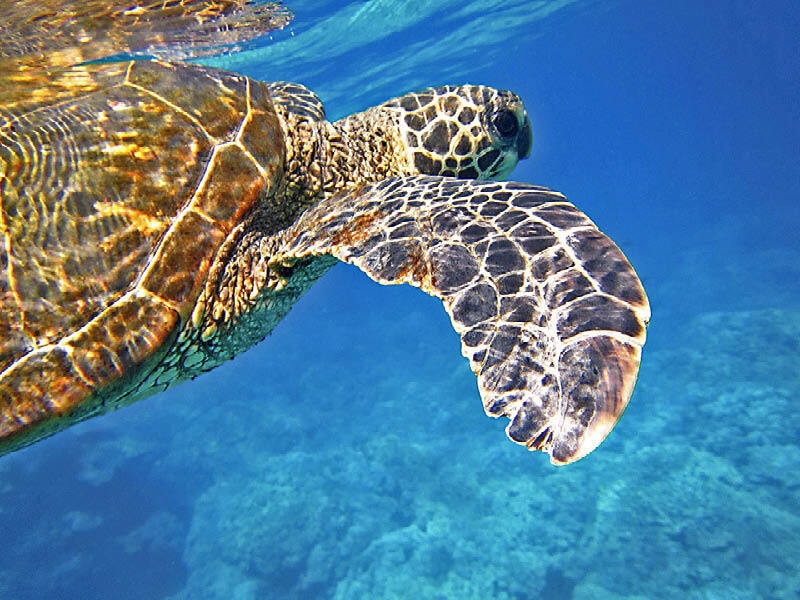 Giant Sea Turtle. It is a very unspoiled corner of the island and, in keeping with its status as a geopark, is not only fantastic to visit from the geological point of view, but also shows great biodiversity and contains a number of national parks and conservation areas. These include the Pangumbahan Turtle Park, where female Giant Green Sea Turtles come ashore and lay their eggs in a protected environment. The forests in the surrounding area contain macaques, leaf monkeys, wild boars, otters, monitor lizards as well as many fascinating birds. With fascinating geology, beautiful landscapes, sandy beaches, excellent surfing, the popular Citarik river for rafting and a diverse range of animals and birds both on and offshore: what more could you ask for? The drive from Lake Louise to Jasper on the Icefields Parkway, through the Banff and Jasper National Parks, Alberta, Canada, is a scenic tour that attracts people from all over the world. Cliffs and glaciers are visible along this three-hour drive, which is best stretched over at least a day, allowing time to stop often for photos, hikes and wildlife viewing. This article will focus on the area north up Highway 93, called the Icefields Parkway, between Lake Louise and the town of Jasper.